Branson has many great golf courses, but here is a summary of three unique quality golfing opportunities. When the quality of the golfing that is available in Branson is combined with all the rest that Branson has to offer the synergy created results in an exciting golfing and entertainment experience. 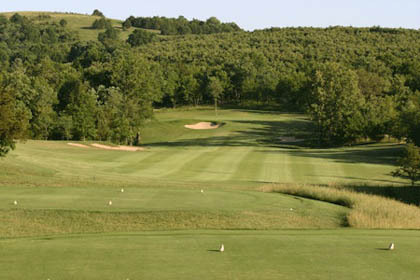 The Pointe Royale Golf Course is unique because it is considered as Branson’s original championship course. Located just opposite the entrance to the Welk Theatre on State Road 165. Pointe Royale was designed by Ault-Clark and Associates and constructed by Carter Golf in 1997. The course was closed during 2008 for a complete renovation and reopened in 2009. Point Royale plays 6,501 yards, has a par of 70, a USGA Rating of 70 and a Slope of 128 when played from the back (Black) tees. It features rolling Bermuda Grass fairways and eight water holes with twelve holes having some sort of water hazard. Managed by Troon Golf, the Branson Creek Golf Club is open year round. It is a par 71, 5,800 yard course with a men’s USGA Rating of 64.5 and a Slope of 116 when played from the Silver Tees. It has Zoysia Grass fairways, Kato-Crenshaw Bent Grass greens and Bermuda Grass Tees with seven holes having water features including two small lakes, creeks, and waterfalls. For information or reservations on the courses mentioned in this article, other Branson golf courses or Branson show tickets, attraction tickets and lodging Miller suggests contacting Branson Tourism Center (BTC), one of Branson’s largest and most respected vacation planning services. BTC can be reached through its toll free number 1-800-785-1550 or its website www.bransontourismcenter.com.